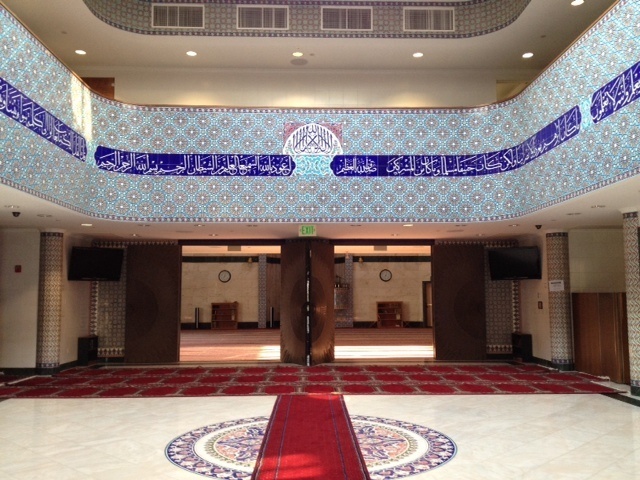 The interior of King Fahad mosque in Culver City, a NewGround partner with Temple Emanuel of Beverly Hills. 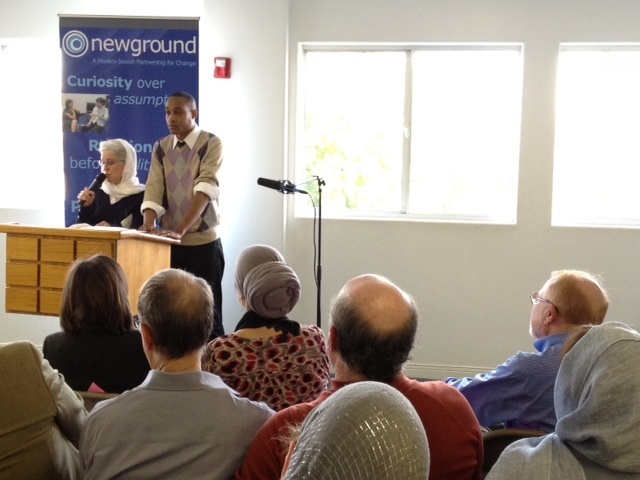 Two NewGround fellows speak about their 8-week experience at a gathering held at King Fahad mosque. 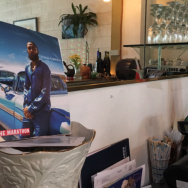 Sitting at an outdoor cafe, wearing knee-high black leather boots and hip sunglasses, Sarah Bassin doesn’t look like most people’s idea of a rabbi. 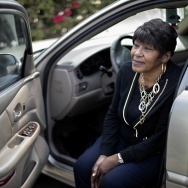 She’s young, lively, and personable. Bassin believes in the need for greater Jewish and Muslim dialogue. From her perspective, it’s a no-brainer. “The greatest predictor for whether somebody is going to be Islamophobic, is if they already hold anti-Semitic beliefs,” she says. Research indicates that both Muslims and Jews tend to suffer equally from discrimination and hate crimes; that’s one experience that these two faiths have in common. Self-protection, the idea of defending one’s beliefs and religious identity, is only one of the many issues taken on by a project called NewGround. The idea came in the summer of 2006, around the breakout of a 34-day conflict in Lebanon that pitted the Israeli military against the militant group, Hezbollah. The war also pitted Muslim and Jewish religious leaders here in Los Angeles--over which side was wrong, and who Americans should support. Things got so bad that Mayor Antonio Villaraigosa convened a task force to bring Muslim and Jewish leaders to the same table. This effort gave birth to NewGround, a joint fellowship project by the Progressive Jewish Alliance and the Muslim Public Affairs Council. In 2011, NewGround became independent from these two organizations; today, it is housed within the city's Human Relations Commission. On a recent night at Temple Emanuel in Beverly Hills, a group of about 20 people — Muslims and Jews, young and old; not all of them devout — sit in a circle and discuss their faith. Over the past three months, this group has been meeting weekly to ponder big questions and figure out exactly what makes them a Jew, or a Muslim. A lot of these NewGround explorations can be somewhat esoteric: Do all Muslims read lines in the Quran in the same way? What’s the difference between how Jews and Muslims think of heaven? Kiran Hashmi and her husband first heard about NewGround last Ramadan, as they attended a service at the King Fahad Mosque in Culver City. But besides the philosophical discussions, there are also the more practical pursuits, like the workshops. At a recent meeting, fellows form groups of three. They are coming up with a specific Muslim-Jewish collaboration that will continue after their fellowship is over. A few ideas are thrown around: One group wants to start a Muslim-Jewish reading club; another, a public forum about the growth in anti-sharia legislation nationwide. Richard Siegel, Alissa Roston and Amir Abdullah are ironing out their idea for a performance and film series. And one main question they’re trying to resolve is: Should it be open to people who are neither Jewish nor Muslim? Sajid Mohamedy, Kiran Hashmi’s husband, is part of another group that wants to raise money for clean water access in developing countries. Figuring out how to get this idea off the ground will be the fun part, he says. The not-so-fun part, has been his introspection thus far. But by the eighth session, all 18 fellows are seemingly more open to talking about faith, tradition, and everything in between. 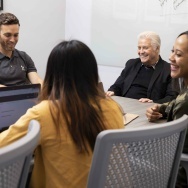 They now have projects to carry out over the next few months—they will be expected to partner up with different organizations, and NewGround will support the plans. And the hope is they will take these projects, contacts, and insights with them everywhere they go from now on--but especially into their mosques and temples.